The straightforward strategy of buying companies that have recently been spun off from their parent has generated very good results. Here’s the performance of the Bloomberg Spin-Off index (BNSPIN Index) since 2003. 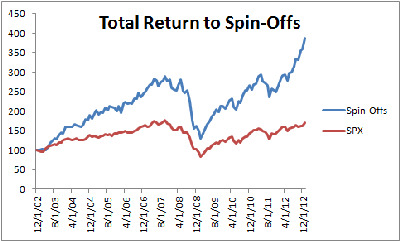 As you can see, it’s pretty good, a 15% annualized return vs a 6% for the S&P500 over that period. Volatility was higher but not extremely so (20% vs. 15%), while the beta was pretty close to 1.0. I don’t think there’s a rational explanation for this. I remember at Moody’s when they just spun off from Dunn &Bradstreet, it was really liberating. For years D&B had used the considerable Moody’s cashflow to fund their dumb ideas to extend D&B, which really ran the executive board while Moody’s made all the money. It was a classic waste of shareholder money, and so when the spin-off finally happened in 2000, Moody’s (MCO) stopped burning its cash and investors reaped the windfall (32% return, annualized, from 2000-present). It’s amazing how much money is wasted via such politics, but it’s a classic case of a bad incentives and difficult monitoring.